Global Internet access now connects people everywhere and on all levels, and our search for a suitable partner is no exception. If I google “dating”, I end up with close to 600 million hits. This is one hot sector! Tinder has been one of the applications at the forefront of this development, and many people now use Tinder. The app matched 12 million people since its release and processed more than a billion swipes daily (HNGN, 2014). I must admit I had used Tinder several times before analysing the app through Octalysis, but the gamification framework has made me more aware of how Tinder make us feel and act. Why do Tinder users fall prey to obsessive swiping? My friend often does 100 swipes in a short period of time, says he’s “Throwing out the fishnet!”. Let’s put on the Octalysis lens, start fishing, and find out how Tinder motivates us to use their app! In Octalysis, we view products and services through different experience phases. The first time you see a product is different from when you’ve used it over time, so for each phase we need to design for different expectations and motivation. The 4 experience phases of Octalysis are: Discovery, Onboarding, Scaffolding and The Endgame. The Discovery Phase is when we are introduced or hear about a product for the first time. Seeing a commercial on a poster for the first time is different from a friend telling us about the same product. Tinder has been downloaded more than 50 million times! That is a lot of social proof, and it surely must create interest for people to use Tinder. Most people are introduced to mobile dating through friends and acquaintances (Core Drive 5: Social Influence and Relatedness). This was also the case for me, and I remember stories about hook-ups, late night Tinder meetings or other non-romantic experiences the first time I was told about dating online. If you discover Tinder from their home-page, you’ll be greeted by a attractive woman in an air balloon, gazing out with a bright red blouse. She adds a personal feeling to my first impression (Core Drive 5: Social influence & relatedness). The introduction movie follows this woman on her travels, and we can see how she uses Tinder at several occasions. She meets a guy, who approaches her and they spend the last part of her holiday together. The overall narrative tells of a dream state where Tinder helps you meet interesting people, and that love can actually happen in their app. My first-impression of Tinder was: “Hey, check out this f***-app”, so I experienced some doubt while watching the intro movie. However, the narrative of travel, unpredictability, fun, new people and new experiences renewed my hopes of finding Miss Right on Tinder! • The discovery narrative tells the Tinder love story. 50 million downloads is a lot of social proof, but more can be done to reinforce this narrative. Maybe they can show people who have become a couple after meeting on Tinder? • Tinder’s discovery film is supposed to be about “real” love, but it did not fit with my first impression as Tinder being a one-night-stand service: it was just not believable enough for me. • Badoo trumps Tinder in SEO, even when you search for Tinder(!) None of the popular apps show if you search for ‘love’. The “rules” of the game are easy to understand and I immediately know what to do. Swiping is intuitive and rewarding. After two swipes I already get a preview of what my first win-state will look like in the app: “It’s a match!”. A perfect Core Drive 5 (Social influence & Relatedness), Core Drive 2 (Development & Accomplishment) and Core Drive 7 (Unpredictability & Curiosity) combo. In fact, the experience has a bit of Core Drive 1: Epic Meaning and Calling here (Chosen one): maybe I have belonged to Tinder all my life but never knew it. Will Tinder be my destined place to find love in my life perhaps? During the first few swipes of the experience, Tinder not only assures me that my swiping is anonymous (I don’t want people to know I rejected them – removing the Anti Core Drive 8: Loss & Avoidance), but being introduced to the win-state (match-screen) also builds excitement (Core Drive 2: Development & Accomplishment). Finally, Tinder has a lot of social proof early in the experience (Core Drive 5: Social Influence & Relatedness). In all, this make me feel safe and excited to win that match! There is only one simple way to sign up for Tinder: log in with Facebook. One button sign-up offers little choice, but what better social proof is there than Facebook? Some users might not be happy with only one way to sign-up, and if you are concerned about privacy, it might make you think twice. But overall the early steps seem both safe, exciting and that there are interesting people on Tinder. Let me click that button! • One button to sign-up creates ease for users, but the reason they do it could be made more clear for new users. • By creating cognitive ease at this point of the experience, there is little or no reason for users to not complete the onboarding of Tinder. And if you do; a few clicks will help you back in. The scaffolding phase starts once a player has learned the basic tools and rules to play the game – and has achieved the First Major Win-State. The majority of the Tinder experience will be in this phase. Even though I didn’t experience a major win-state myself, Tinder has already shown me one before, and my hopes of getting such a win-state is firmly rooted in my brain! Tinder wastes no time; as you log in via Facebook you are taken directly to the above screen: excited to start swiping! As I swipe the first time, a message pops up asking me if I made the right choice! Wow, this shows Tinder cares about my choices and make sure I don’t miss out or regret my choice! (Appealing to my Anti Core Drive 8: Loss & Avoidance). One can see this as a start of The Alfred Effect (#83), where a product or service is personalised to the users’ needs. The Alfred Effect is at play whenever you ever feel that a product or service knows you. The main page also displays the “pile of people” that are waiting for me to browse through. This gives a feeling of Core Drive 6: Scarcity & Impatience (How many are left after this one?) and Core Drive 7: Unpredictability & Curiosity (always letting me know that there are more fish in the sea). I spend less and less time evaluating a girl before swiping left or right, and notice how quickly the swiping becomes a habit, with the repetitive act swiping and being rewarded with matches (reward loop). But over time I see these matches only as temporary wins, it is the activity itself that becomes the reward. I barely watch the the screen as I evaluate all these girls.. (Ignorance is bliss?). As I keep swiping images of girls, the green heart seems to be emptying. I suddenly realise that I do not have unlimited swipes at all! In fact I only get 100 swipes every 12 hours (#68 Magnetic cap and #66 Torture Break). These are all techniques related to the Core Drives on the bottom half of the Octagon (Black Hat motivation). When something on offer to us is being limited (“you can only use 100 likes”), we are more likely to want to use all of those hundred in contrast to unlimited likes. We are drawn to the artificial limit: the Magnetic Cap. The torture break forces us to leave the experience when we’re out of likes, but we will constantly want to check back on the countdown timer (Core Drive 6: Scarcity & Impatience, Game Technique #65). I want to start swiping again! When the 12 hours are done, Tinder sends a push notification saying “New likes available, come meet your match”. Yes! My first match! The back of the screen darkens and my profile picture is neatly displayed next to my match to enforce the win-state: Social pairing! Tinder offers two neutral choices: 1. Send a message, or 2. Keep swiping. I can easily one-click back to the game. Tinder also offers the possibility to share my match, but there is no obvious trigger for me to do that (I tried to share it with myself and the text displayed a SHORT-url to my matched profile, and which number she was). I decide to click “Send a message”. Now what should I write? Tinder automates messages under my matches’ profile picture: “Everybody likes a thoughtful person”. This is social proof, but not very strong, and I am still not sure what to do at this point. There are no clear actions for me to take, and my cheeky one-liners probably won’t hold. By clicking the GIF-button I can browse and search a selection of GIFS which does reduce the barrier of engaging with my match.. Tinder says GIFs sent are 30 % more likely to receive a response than messages (TIME, 2016). Empowering users to use their creativity and freedom supports the evergreen mechanic, where a developer does not continuously have to add more content to an experience to keep it going (Core Drive 3: Empowerment of Creativity & Feedback). When it comes to texting my skills are the worst, so I try clicking on her photo. The integration with Facebook and Instagram comes handy at this point, and if we have common interests or mutual friends it shows. There are no obvious triggers for me to start writing a message or to send a GIF, and I’m a lazy chatter, so I leave my match to get back into the swiping game. The integration with Facebook (and then again with Instagram), already renders a personal profile for me! This reduces the time I have to spend filling in sign-up information. It also increases my feeling of ownership and possession, and some unpredictability and curiosity as I “discover” my profile for the first time. There is limited freedom in terms of editing my profile. The only things I can arrange are my quick bio and 6 profile pictures (to be be uploaded via Facebook). After trying to come up with a smart introduction for a few minutes I realized I felt an upcoming urge to swipe again! The black hat compulsion won…. Back to the (very addictive) game. Back at the home screen I notice a blue star at the bottom right, and I click it. “You’ve sent a SUPERLIKE!”. Wow, a nice animation pops up, and a star is sent up the screen! I am not sure exactly what this SUPERLIKE will do, but as I try to click it again a few swipes later; a huge countdown-timer shows in the screen. At this stage there is no obvious desired action to take, unless I want to buy unlimited likes with Tinder Plus. The red colour does not make this an appealing choice, and with no swipes remaining there is little motivation for me to stay in the experience. • Tinder nicely takes me straight to the experience, and already after the first dozen swipes I experience cognitive ease, and the swiping becomes close to effortless. • I still miss a way to personalize my profile more (Core Drive 3: Empowerment of Creativity and Feedback and Core Drive 4: Ownership and Possession). • Instead of presenting users with Tinder Plus at the point where all likes are spent, and “all hope is lost” – they should seek more gentle ways of introducing Tinder Plus to users. This is the phase where users have done everything there is to do at least once (according to their perception), and they are figuring out why they should stick around and continue to play the game (especially when there are newer, more exciting alternatives out there). • Tinder emphasises on Core Drive 5: Social influence and Relatedness throughout the experience, and they provide us all with the feeling of “being in the market”. • Tinder should consider using more positive and real-life social proof: Show and tell about the people of Tinder: What is the most common way to meet through Tinder? What do most people (that meet in real life) write? Have people fallen in love through the experience? • As motivation seems directed at users to collecting matches, and not as much to engage with them, obsessive or unwanted behaviour could occur over time. ) It is evident to some degree that the experience encourages starting conversations, but during the end-game there is a lack of incentives for meaning and long-term relationships (Core Drive 1: Epic Meaning & Calling). Overall Tinder has designed a system for high engagement. Tinder has built a great discovery narrative, with social proof (arguably weak) that love can happen on Tinder. With Facebook integration, the sign-in process is incredibly fast, you are shown a win-state and boom you can start swiping. But as you go through the experience, you feel less in control and more obsessed about spending all the available swipes you have, to collect an increasing amount of matches that you are not talking to. This is very similar to how slot machines work, it is the spinning that is addictive, the unpredictability of what will happen next; the matches are only temporary joy. Over time, the experience becomes a mindless exercise only to feel like I am “in the market” (Core Drive 5: Social influence and relatedness). 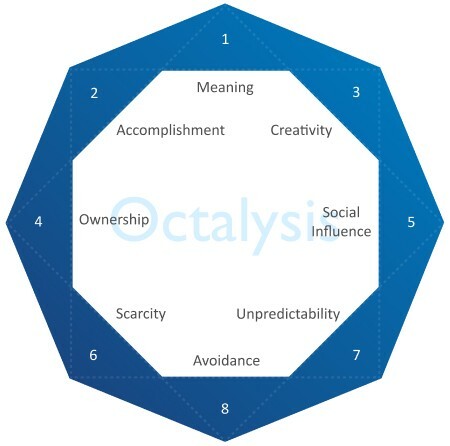 In Octalysis we balance White Hat (CD1: Epic Meaning & Calling, 2: Development & Accomplishment, 3: Empowerment of Creativity & Feedback) and Black Hat Core Drives (6: Scarcity & Impatience, 7: Unpredictability & Curiosity, 8: Loss & Avoidance). Too much emphasis on Black Hat techniques creates a lot of urgency, but too much of it in any experience will make us feel not in control, obsessed or anxious. In contrast, White Hat Core Drives make us feel in control, fulfilled and satisfied. Tinder should think about this balance more, as I the experience is mainly Black Hat, leaving me feeling that I have no control over my obsessive swiping. For me online dating may already be more about swipes than looks!